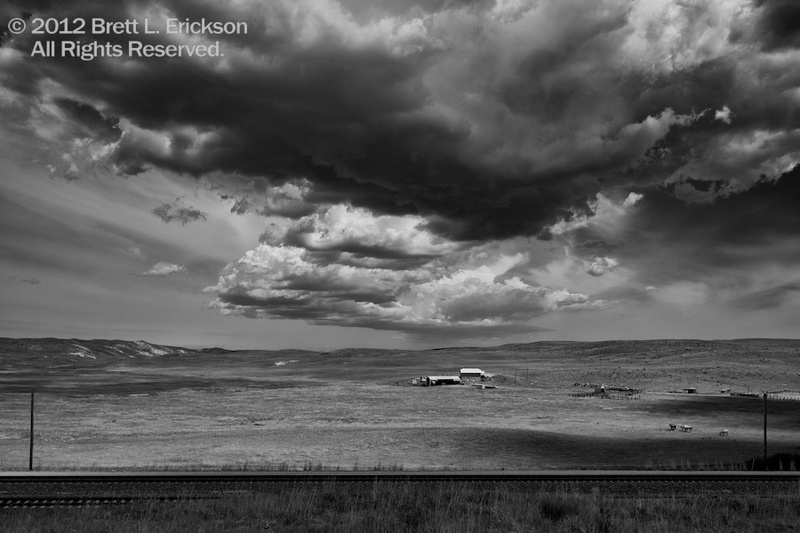 Thursday night last week was one of those magical evenings when, as Ansel Adams was fond of saying, “Chance favors the prepared mind.” I had been to Lost Springs a number of times to photographically explore, but as storms rolled across east-central Wyoming near evening, I came back with the expectation of something…special. 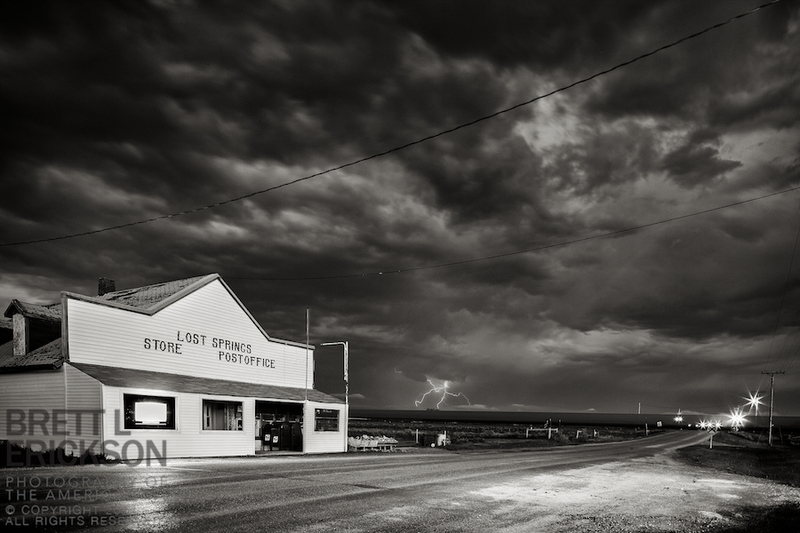 Chance, indeed: A train rolled through town, allowing life in the shot, and as a gift, the storm gave me a lightning bolt. Just my way to celebrate the first blizzard of the season: rush out into it, and shoot pictures. 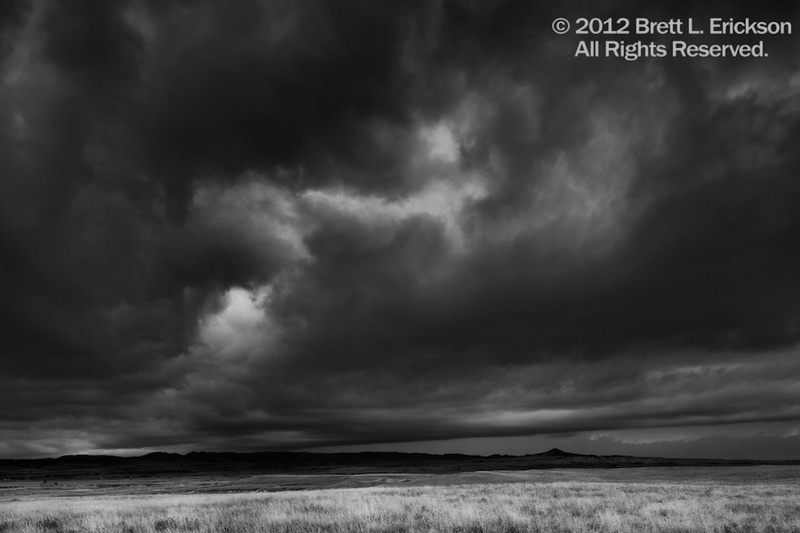 I often think the weather and fate conspire to help me find emotionally powerful landscapes and people. 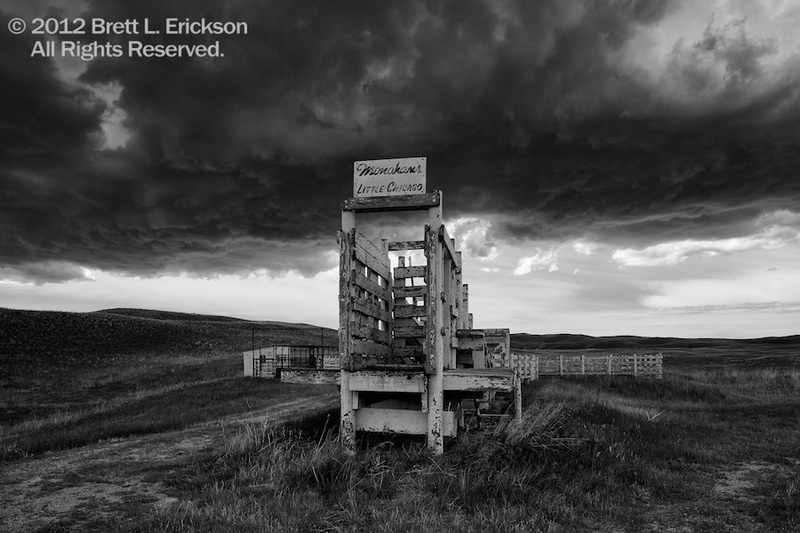 Case in point: the Little Chicago cattle yard in this photograph. Begin story. Over the second hill about 1/2 mile down the road was this cattle yard. I slammed on the brakes, tossed the truck into the side of the ditch to park, and out we ran as the storm rumbled violently around us. Rain looked imminent, and in fact, more than we expected. But the light. Oh, the light! The rolling expanse of the Sand Hills, the roiling black clouds backlit by late afternoon sun, the texture of the grasses and the irony of Little Chicago. Lucky? Boy, were we ever. This is the landscape of my youth: the southeastern last finger of the Sand Hills, their rolling tall grasses broken by occasional cornfields and stands of trees. It differs from the central and northwestern hills, with their intermittent ponds, lakes and absent trees, but in all hold true several constants: grass, sand, storms and sunsets. 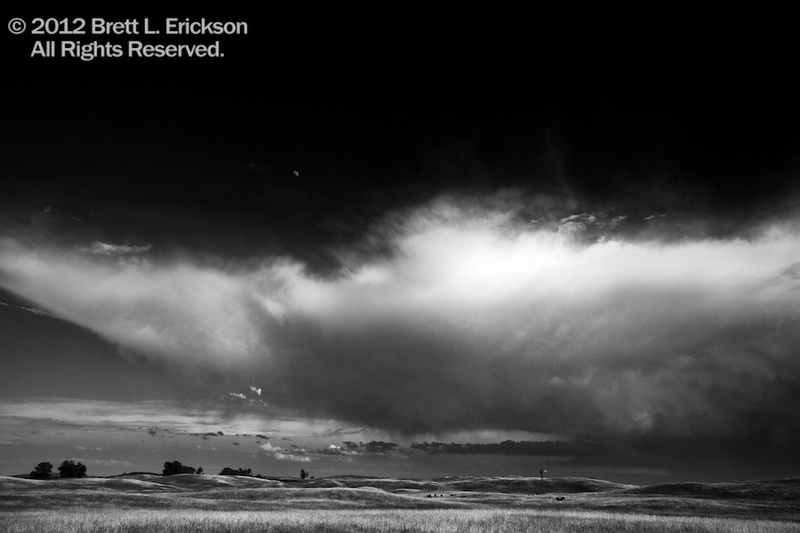 The truly cavernous sky of the Sand Hills makes storms seem either miniscule or massive, and on this Wednesday evening, with its brilliant warm light flooding the plains, a large storm appeared toy-like and benign when compared to the moon and open heavens. 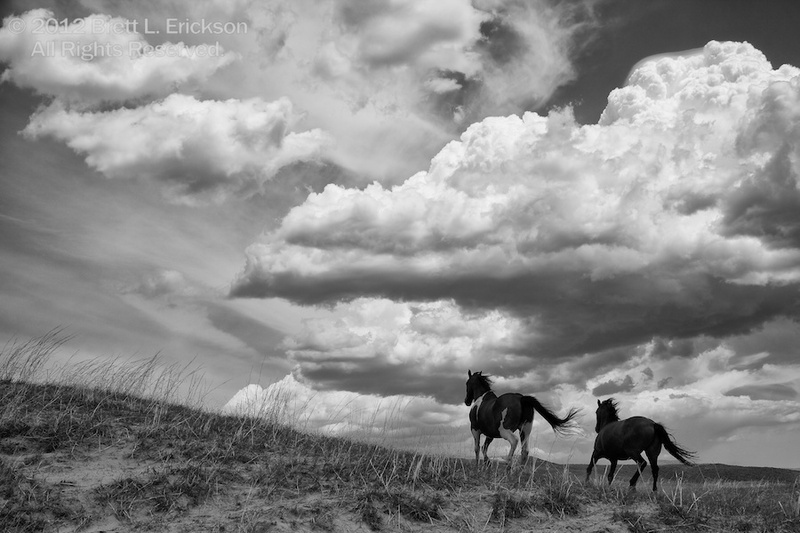 As I pursued a storm moving east through the Sand Hills, hoping for more images, these two horses staring down at me from the top of a grass-covered dune stopped me in my tracks. I scaled the 30-foot dune, and as I did… the horses fled. An interesting part of living in Nebraska is the size of the sky, and with that size, how much more dramatic our storms are as they build. 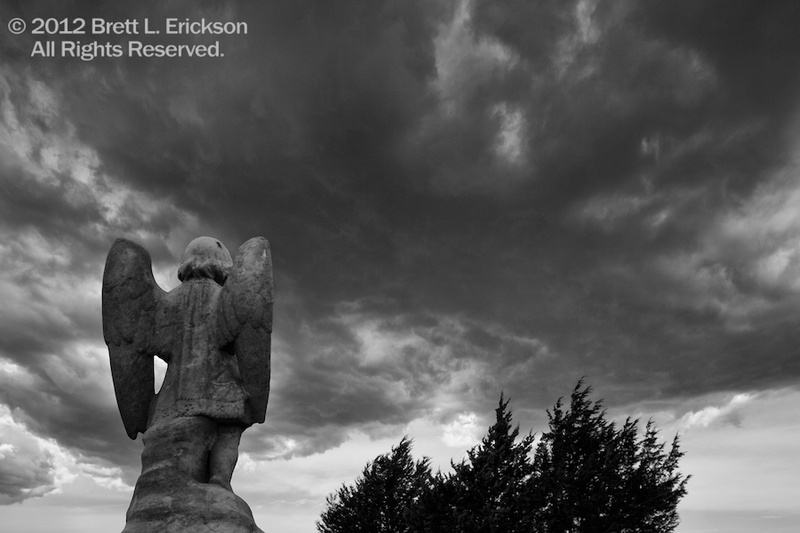 Moreover, that combination of sky and storm often requires photographers to break one of their cardinal rules: photographing more than one hour after sunrise. In Grant County, on a Wednesday morning, this storm began its life as I passed these horses and meager ranch, and the sun rays dappled through the burgeoning atmospheric cataclysm to illuminate the horses for fewer than 60 seconds. Why sit out a severe storm with a history of tornadoes on a dirt road with no cell service? 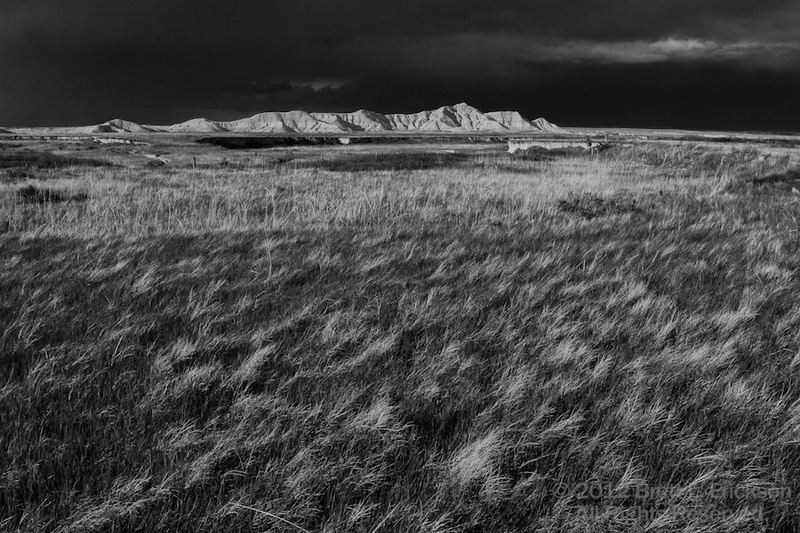 Because at 7 o’clock in the evening, with the storm on the northeast horizon and the sun to my side, the contrast of the white badlands, yellow prairie grass, and the black storm created textures worth taking such a chance.